In Module 9 of our 10-week, Free Online Psychometric Testing Course, we look at Psychometric Test Feedback. Feedback is a critical part of the process of psychometric testing at work, but is often not done at all, or not done properly. We will show Learners why feedback is critical, and how to provide professional feedback to candidates and decision-makers for both aptitude/ability and personality assessments. To be scientific in the use of test results, we need to feedback in terms of job requirements and so we will also discuss how to do this. 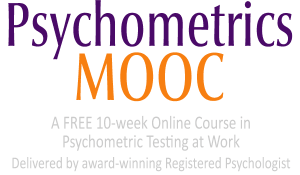 Module 9 will be released on 2 December, 2015 to those registered for our Free Psychometrics MOOC. Below is a longer outline of what is to be covered. We start off this Module by discussing why feedback is necessary. Some people think that there is no need to feedback to respondents, especially if your reason for testing is for selection rather than development. We take some time to show you how feedback benefits not just the candidate, but also your organization and the reason for testing in the first place. We will also look at why it’s important to give professional feedback to decision-makers and not simply hand them a chart of test scores (one reason is that this often results in errors due to limited understanding!). Having convinced Learners of the need to provide feedback, we then learn about how to professionally feedback both aptitude/ability and personality assessments to candidates and decision-makers. We also consider how to link assessment results and candidate interview results with job requirements.